Cape Town - General secretary of the South African Federation of Trade Unions (Saftu), Zwelinzima Vavi, has called the national minimum wage a slave wage and challenged President Cyril Ramaphosa and other politicians to try and live on R20 per hour. 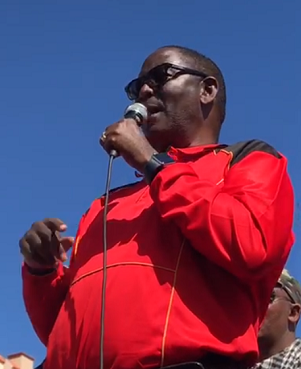 Vavi was speaking at a rally outside Parliament on Thursday afternoon. Members of the Western Cape arm of Saftu marched to Parliament where they handed over a memorandum to a representative of Parliament, rejecting the national minimum wage and amendments to labour laws. In his address to the crowds, Vavi unleashed a verbal attack on Ramaphosa. “These amendments (labour bills) are being pioneered by President Cyril Ramaphosa, they call him a buffalo as if it is a good thing,” said Vavi. “Why not take R20 [an hour] for yourselves just for one month and see if you can afford the Dogmor (dog food) for your dogs. They have medical aid for their dogs. [They must] see if they can afford medical aid for their cats and their dogs,” Vavi said. Vavi asked how R20 per hour could be associated with the concept of a “better life for all” or radical economic transformation. Vavi also took aim at Ramaphosa’s millionaire status, which he achieved when he left politics and pursued a business career. Vavi illustrated that the minimum wage is not enough for a McDonalds burger. Ramaphosa sold McDonalds South Africa when he took on the role as deputy president in 2016. Saftu wants Parliament to respond positively to its demands before April 25 and threatened to make the country ungovernable. “We want to give them a warning - we are going to resist. We are going to fight back," Vavi said.